The 13th April was a very important date for Dartmouth Karate Clubs 11 year old Megan Langworthy. That will be a date that she will remember for the rest of her life, as she passed her shodan (1st Dan black belt) grading. The grading was held at the end of a week of intense training at the Karate Union of Great Britain’s yearly spring camp held in Paignton. Megan had trained throughout the week with several of the KUGB’s senior instructors, all of whom have trained for over 40 years, and are revered throughout the world. 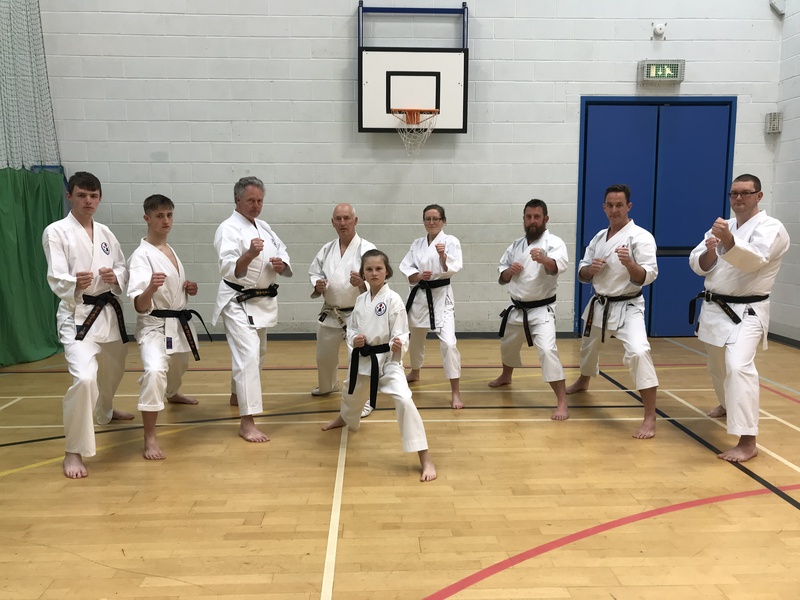 Megan started training at Dartmouth Karate Club in 2015, and it was soon evident that she was on to watch, as she was always at training, and just before her first grading she got upset because the 90min training session was coming to an end and she wanted to train more! Megan’s grading was taken by Sensei Andy Sherry 9th Dan and Sensei Frank Brennan 8th Dan. Sensei Sherry is the chief instructor of the KUGB and has been training for nearly 60 years, so Megan was under very strict, watchful eyes. Megan had to fight a boy for her Kumite (fighting), and showed her great spirit by not giving him any time or space and dominated the fight. Dartmouth Karate Club is very proud to have their youngest black belt join the dan grade ranks. If you are interested in learning Karate, please get in touch with either Peter Atkins 01803 833794 or Kain Harper 07816897251 or visit Dartmouth Karate Club online. Pictured is Megan with most of the clubs black belts and instructors. Next story 3rd Dan Sucess for Chris! Previous story Dedication & Devotion leads to Success!